One of the improvements introduced in 2017 is the two-step authentication to enter Signaturit's platform. This feature gives greater security to our customers who have the option of creating teams (holders of Business and Business+ accounts). When enabling two-step authentication , team members are required to use a unique security code to access their Signaturit account, in addition to using their email and password. You can activate the two-step authentication functionality for you or any member of your team. More information: How to enable two-step verification for your Signaturit account. The Settings section update was carried out with the aim to further simplify managing your Signaturit account, so that at any time you can easily manage your contacts, change your security options or consult and manage your billing, among others things. With this update we have made the navigation more intuitive and the visual design is much finer . You have all the information on the new Settings menu in our Help Center. In addition to the Settings section, in 2017 we also have re-designed and improved the Team section. The new design of this section responds to the need to facilitate managing your teams in Signaturit, and help you make better decisions about them thanks to the statistics included. In our Help Center you will find all the information about user management. For customers who have the option to create teams, this year we have also introduced the option to strengthen the security of each team member's account in Signaturit. This option consists of establishing a policy of mandatory password requirements for team members. For example: determine whether the password must contain a minimum number of characters, or if it must contain at least one uppercase or lowercase letter, or defining an expiration date, etc. Read this post to learn how to set up password requirements for your team members. Among the features that this year have moved from beta to fully operational, we'd like to highlight the option to send documents to be signed in parallel. In many cases, a document or contract needs to be signed by several persons at the same time. And we have solved this situation with what we've called parallel delivery. 3 ways to send documents to sign with Signaturit: which one is best for you? Sequential, Parallel and Batch Delivery. If you have not enabled this feature yet, send an email to support@signaturit.com indicating in the subject that you want to activate it. The option of creating and saving templates of documents that you need to send to sign recurrently is a highly valued feature by our customers. To improve this feature, in 2017 we have introduced the ability to share templates with other team members, or other groups you have created in your Signaturit account. Thus, we facilitate workflows and help you achieve synergies between your different Signaturit teams or groups. More information: How to share templates in Signaturit. Another new feature introduced in 2017, in this case related to our certificate delivery service, is the option to password protect the PDFs that you send through our certified electronic delivery, which can be both certified email or certified SMS. Thus, to open the PDF, the recipient will need a password which you must provide to him/her. This way you are minimizing the risk of phishing. 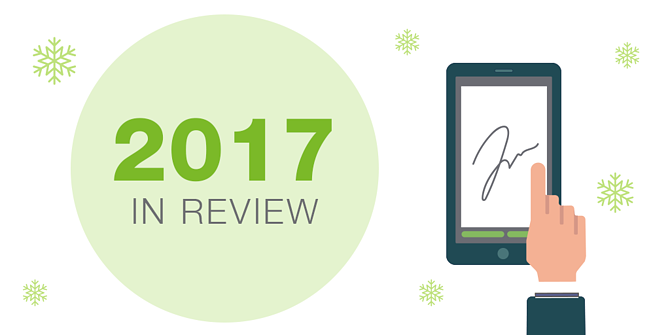 We hope all these developments have helped you make the most of our electronic signature solution in 2017. And we encourage you to remain vigilant to all developments we’ll launch in 2018, which will continue to help you further optimize document management processes within your company. If for next year you are thinking of integrating our electronic signature solution in your usual management software, do not miss the post summarizing all updates of our API in 2017. That said, we wish you a Merry Christmas and we hope that 2018 comes brimming with new exciting projects for all.